December 28, 2011 - U.S. Customs and Border Protection received an unmanned aircraft on Tuesday, the fourth at National Air Security Operations Center in Sierra Vista, Ariz. Flights performed from this location will provide critical aerial surveillance to CBP border security personnel on the ground along the Southwest border. The arrival of the Predator-B marks the second of two unmanned aircraft earmarked in the supplemental budget provisions identified in August 2010. The Predator B is an unmanned aerial vehicle (UAV), capable of remote controlled or autonomous flight operations, developed by General Atomics Aeronautical Systems (GA-ASI) for use by the United States Air Force, the United States Navy, the CIA, U.S. Customs and Border Protection, the Royal Air Force, and the Italian Air Force. The Predator B and other UAVs are referred to as Remotely Piloted Vehicles/Aircraft (RPV/RPA) by the U.S. Air Force to indicate their human ground controllers. The Predator B is the first hunter-killer UAV designed for long-endurance, high-altitude surveillance. CBP?s unmanned aircraft systems operate under several FAA-approved Certificates of Authorization that enable CBP to deploy a UAS in the national airspace. On the southwest border, the first certificate allows access into Texas from Arizona to just west of the Big Bend border area. The second certificate enables CBP to launch and recover a UAS from Naval Air Station Corpus Christi, Texas, and to operate along the entire Texas land border with Mexico, the coast, and over open water. On the southwest border, CBP now operates a total of six Predator-B aircraft from Sierra Vista, and Corpus Christi. The missions from these two centers will allow CBP to deploy its unmanned aircraft from the eastern tip of California across the common Mexican land borders of Arizona, New Mexico, and Texas. 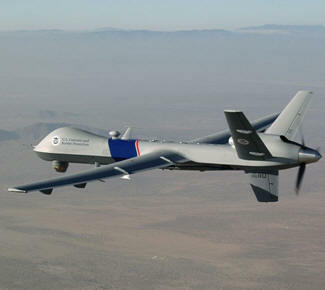 CBP identified Arizona as a location for its ninth UAS because it will allow for the greatest support of the CBP Air and Marine Strategic Plan to secure the shared land border between U.S. and Mexico, and will allow for the most effective execution of counter-drug operations and Homeland Security missions. Additionally, basing a fourth UAS in Sierra Vista will best posture CBP for rapid deployment throughout the southern tier of the U.S. and the Western Hemisphere. This operational capability increases CBP?s ability to provide disaster relief and humanitarian support in the Gulf Coast region. Since the inception of the UAS program, CBP has flown more than 12,000 UAS hours in support of border security operations and CBP partners in disaster relief and emergency response, including various state governments and the Federal Emergency Management Agency. The efforts of this program has led to the total seizure of approximately 46,600 pounds of illicit drugs and the detention of approximately 7,500 individuals suspected in engaging in illegal activity along the Southwest border.